Junk disposal. It’s a messy business, no matter the size or items. When you have the time to go through your garage, attic, or storage space, you’re quite likely to find some old favorites, but even more likely to find things you don’t use, don’t need, and no longer want. 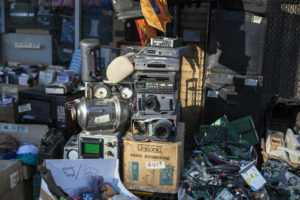 Broken and outdated appliances, household decor, and household furniture, are also things that gets thrown-in, along with ripped and stained clothes. Of course, there’s no reason to keep all that stuff around, so you drag it over to the curb thinking the local garbage collection agency will haul it off. Pickup day comes and goes and all that stuff still remains on the curb.You wonder why and go online to find out why it wasn’t collected only to discover nearly all of it is items that aren’t on the acceptance list. So, you rent a truck and load up as much as you can and take it to the local landfill. That’s when you learn it’s going to cost you a small fortune to dump all that junk and you decide to take it back and figure out another way to rid yourself of it. This is why so many people wind-up piling junk–they can’t easily or cheaply, get rid of it. Practically anything that you throw on your junk pile is a safety and/or health hazard. Old appliances often contain hazardous materials and are a place where pests can find shelter. In addition, these items, particularly when left outside, area a prime location for mold and mildew, which isn’t something you want spreading out. Old clothing and household decor is also a breeding ground for mildew, bacteria, and mold. In addition to these, that junk, as the nearby quote points out, is a fire hazard. When stuff is piled high and deep, that serves as a lot of fuel for a fire. Needless to say, it’s not safe or healthy to keep junk lying around and the cheapest and easiest way to rid yourself of it is to phone a junk removal and hauling service. In the meantime, you should stay safe as possible. If you’re able, put all of it into a pile that’s away from your home. Wash your hands thoroughly after handling junk because it’s likely germs will be present and that can be the source of illness. Be sure to wash-up good and use a clean, dry towel.If you have non-working appliances in your home or in the garage, cut the power cords off so these don’t pose a safety hazard to children. In addition, you should also remove doors from old appliances. When you call the junk removal and hauling service, ask about recycling items. Some things can be recycled and given new life.If you need help with junk, just phone 800-433-1094 or visit Junk Garbage Removal.